Some 7 months ago, when I presented my solution to the 1973 Coyne Incident, I mentioned a few other UFO cases that have been explained as aerial refueling tankers. I also mentioned some disagree, and I might take a closer look at them too at some point. I was mainly interested in the Exeter case due to its high significance in the history of UFOs. That case popped up once again a few days ago while I was reviewing some events of that history, and I decided now is the time to take that closer look. Along the way I will note several lessons from and similarities with the Coyne Incident. The Exeter incident happened on September 3, 1965 near Exeter, New Hampshire. To put it briefly and bluntly, one hitchhiker (Norman Muscarello, age 18) first alone and then with two cops (Eugene Bertrand, age 32, and David Hunt, age 26) saw a group of bright flashing red lights at night, two of them believed they were very close, and got mightily scared. That probably sounds awfully unimpressive and vague compared to the typical ufologist accounts you have probably read. And if you haven't, you may want to read a summary from Wikipedia, since I won't repeat all those details here. Wasn't there specifically five lights that flashed in a certain sequence in 60 degree angle, lowest always in front, turning houses red, performing strange and extreme maneuvers, coming very close and low? Such details sure are what the ufologists' versions tend to emphasize, but as usual, they just pick and choose the details that seem to make up a good story while ignoring other accounts that contradict them, and expose the cases for what they really are. My version above factors in all the uncertainty resulting from those contradictions within the witness accounts, and there's a LOT of them, even for a UFO case. That's pretty much what is left after that, as I will elaborate later. Probably the most significant lesson from the Coyne case is to always read the earliest accounts possible, instead of the Hollywood adaptations promoted by ufologists. Sometimes the ufological disclosure costs, as the original accounts are reserved for books, as was the case with the Coyne Incident. But in this case the most significant ones can be found freely from Project Blue Book archives, which are available at least from the Internet Archive and from Fold3. Those links contain the scanned pages related to the Exeter Incident, including the original statements by the three primary eyewitnesses (pages 129-131) and NICAP report forms two of them filled (pages 113-128). But there's a small problem with those. The scanned pages are not in a well-defined order, and it's not too clear which of those report form pages were filled by which witness. NICAP has a large case page for the incident, which among other files includes a combined PDF containing those said documents in a sensible order. Unfortunately many of the other links there do not work anymore. It's just a thing that happened and we reported it the way it happened at that time, which you know is about all you can do I guess. He also stated he did and still does have an open mind about UFOs. So it seems actually being there didn't make him the sort of believer others have become just by reading about the event. What needs to be explained anyway? Let's make this clear: it's yet another lights in the night sky, which are known to be prone to all kinds of misinterpretations. There's no actual evidence of anything, no photos, no video, no artifacts, no radar data, nothing. Keep that in mind when people begin to demand such evidence for the mundane explanations even though the supposedly mysterious had none to begin with. Without such evidence, it's all about the credibility of the eyewitnesses. There better be several, and they should be good and at least tell a consistent story, if that's all there really is. Some authors like to suggest there were dozens of witnesses, but they are just counting the additional but differing UFO reports over the next several weeks, possibly also some that happened before, as is typical for sighting waves triggered by publicity in the media. And this sighting gained a significant amount of it at the time. If one sees five red lights in the sky, and another, say, a white one a week later, linking those two is just a baseless assumption. Incidentally, doing just that is at the core of all that talk about "The Phenomenon". The fact of the matter is that there were only three known co-located eyewitnesses who saw the same event and lights, and one of them also had at least a similar sighting an hour or so earlier at the same location. I, Eugene F. Bertrand Jr., was cruising on the morning of the 3rd of September at 0100 on Rte. 108 by-pass near Exeter N.H. I noticed an automobile parked on the side of the road and stopped to investigate. I found a woman in the car who stated she was to upset to drive. She stated a light had been following her and had stopped over her car. I stayed with her about 15 minutes but was unable to see anything. When Bertrand stopped and asked if she had a problem, the woman told him that a "huge object with flashing red lights" had been following her car for 12 miles (19 km) and stopped over her car before flying away. Bertrand considered her a "kook", but did stay with her for approximately 15 minutes until she had calmed down and was ready to resume her drive. See what they did there? Now "a light" has turned into a "huge object with flashing red lights". Certainly makes it sound as if there was a definite connection, but that's not even close to what he originally stated. As for what that woman originally really told, we don't know, since she didn't file a report and Bertrand didn't even take her name. Why bother, since he thought she was a "kook", and reportedly "reassured her that it was probably just a star", which hardly sounds anywhere close to "huge object with flashing red lights", does it? Some intensive investigation! Does this sound like high-altitude aircraft or stars and planets twinkling? "Well, we all returned to the station to write up our report. We'd only been back a short while when a call came in from the Hampton telephone operator. She told us that she'd just talked to a man who was calling from a phone booth and was very upset. He said that he was being chased by a flying saucer and that it was still out there! Before she could connect him with us, the connection was broken. We went out looking for him and even went to the hospital to see if he'd been brought in there, but we never found out who he was." That third hand account of a "flying saucer" by an unknown guy hardly has enough detail to claim a similarity or connection to those supposed five red flashing lights either, does it? So really, if we are supposed to believe those aforementioned details about the lights are accurate and significant, there were only three witnesses that described something along those lines. The ufologists can't have their cake and eat it too. And as we shall see later, that cake doesn't really have even three candles. So there were six of them, Muscarello, Bertrand and Hunt plus the unnamed woman plus a male motorist. Wait, were the two sightings by Muscarello done by two independent versions of him or who's the sixth one? And calling those descriptions "identical" is just a ridiculous lie. It's also important to remember those weren't really three independent witnesses, but witnesses primed by each other. Bertrand had first heard the stories of that unnamed woman and Muscarello, and was primed to see weird red lights. Hunt in turn was called there by Bertrand to see the same. Hunt and Bertrand both worked together, and later signed various letters to Project Blue Book etc. together, making it unclear if the features claimed in those letters really reflected what both saw. Since their individual statements and report forms directly contradict some of those, it seems clear they did not. In what stretch of imagination were they "entirely independent of each other"? It should be also noted that both Bertrand and Hunt admitted having read UFO literature in the NICAP forms. So in reality there were only three witnesses that can be reasonably assumed to have witnessed the same target. Although there are problems with that too. Muscarello didn't actually even mention that second sighting together with the others in his initial statement. He talked about that too later in his 1980 interview, in which he didn't mention those details like the number of lights for either sighting. So there are some questions in how similar his two sightings actually were. Another issue is that Hunt arrived late for the show. There's once again a bunch of contradicting accounts on how late, but he did mention only having seen the lights when they were already further away, and he wrote in his report form the closest estimated distance to the object he saw was 9000 feet (=1.7 miles) at closest, and at about 2-3 miles on horizon. So actually there were only two claiming to have had a close encounter. Bertrand said the closest distance was 100 feet but Muscarello's accounts are less clear, especially for that later sighting. It seems the witness statements were originally given so much weight just because two of them were cops, as that certainly cannot be based on the contradicting and changing stories they actually told. But only one of them even claimed to have seen the lights from a close distance, and that supposed distance, and especially the emotional reactions it caused on those men, were the highlights of the otherwise bland case. Can you describe Mr. Muscarello to me? Do you remember what he looked like, his attitudes and things? Well he's a kind of a crazy kid in a way. So if you hadn't seen this yourself, you might have figured he was making it up? Now don't put me on the line because I'm no professor of science, that's for sure. And I want you people to know that the only reason I went to that station was because I thought I was cracking up. I was pretty much your age. Well, you see, after Scratch had told me of this, he got on the blower (police radio). Here comes a cruiser. Gene Bertrand, some of you people might know him, he just retired, pulled up and said, Come on. I want to see what you're talking about. And the only reason I'm following this up is because we have other reports." Otherwise they would have sent me home. And I never made a penny on this thing and that is the truth. Not one red cent. I'll tell you why I'm glad I didn't: Because I think it makes it more believable. I'm glad I'm not crazy. I'm glad somebody else, who was responsible and credible saw it, not just myself going and thinking for the rest of my life, "Am I a nut?" You know, I've been called a number of things. I would have believed myself that I had something loose up there. So I guess he wouldn't have disagreed with Bertrand too much then. Since Hunt didn't see that much, and Muscarello seemed to trust Bertrand more than himself, it seems pretty clear who ended up being the star of the show. We have already seen some examples how Bertrand's stories tended to change, and there's more of that later, but what sort of an observer was he? At one time while I was watching them, they seemed to come so close I jumped into a ditch to keep from being hit. Very distant, pulsating erratically I couldn't make out any distinct pattern, circles or anything like that. It was just very bright. Could not make out a silhouette at all. I didn't know what it was. There was absolutely no sound, other than the fact that I heard horses in Dining's field, raising holy hell, kicking the barn. Crickets seemed to just quit.... My attention was fixed on these lights. I didn't know what it was. Passed over, kind of like disappeared. I don't know what direction it went in. I was kind of dazed. My eyes were like, you know, seeing spots you go through when somebody takes your picture with a camera. Got my eyes cleared -- son of a gun -- here it comes again. I don't have to tell you, you get kind of nervous out there. I mean I'm all alone; there's nobody else standing there to refer to. I mean, is this guy smoking something? I just froze up. I didn't know quite what to do. I got scared. I ran across the street. I didn't actually dive, I fell, because I tripped on something and I fell into the ditch, and I lay there with my head down. And I looked up, and it was like the whole side of this house which was next door, the next house down from Dining's -- I didn't know the people at the time, but I found out that it was Mr. Russell later -- the whole side of the building seemed to turn out like a blood red. And yet the lights weren't completely all red either. It was a white house and these lights were still pulsating in erratic positions. I couldn't make out any design or silhouette at all, and then (he whistles), it took off. I don't even know what direction it took off in because I had my head down after that. I got up out of the ditch and ran to that house, pounding on the door. Later on I discovered that Mr. Russell was awake. Mrs. Russell told me later that they were awake and they heard me pounding, but they're not going to answer the door with this crazy nut pounding at two o'clock in the morning, no car out front or anything like that. So they didn't bother answering, but they did remember me. Well, no response there. Gee, he saw red after being dazed for staring at bright red lights? And the people, who were awake, who actually lived in the house that supposedly turned red, and had horses "raising holy hell" nearby, didn't see anything that would have warranted them at least asking someone pounding on their door if their house is on fire or something? It's noteworthy that the sentence about him ditching, that he later revealed wasn't actually true, was also the only one in his original statement that indicated the object came close. Did he lie that part too? Note also he said the lights "seemed to come so close", which doesn't indicate he was too sure they in fact did. He also doesn't specify distances in that later interview, other than the "very distant" in the beginning. Neither does he specify those other key details about the lights, not even how many there were, and instead states they were "pulsating erratically" and he "couldn't make out any distinct pattern, circles or anything like that." As for those animals, it's easy to see causation when there's none, and the reason they made noise, if they did, could have been something else. Or for no good reason at all, as animals oftentimes do. But it is of course possible that they got scared by red lights too at night, just like the hominins. Maybe they could then function as badly needed additional witnesses? So Muscarello's close encounter wasn't necessarily quite as impressive as typically told, if even he believed it to have been that close in the first place. So how about Bertrand's then? Did he keep his cool? Gene went up to the same spot where all this had taken place. He and I got out of the cruiser. He had a good-sized seal beam flashlight. We were on our way into the field. He wanted to actually go right down in there and look around. You could see the whole field from the road, but he wanted to do that anyway. Before we got out to where we had stopped, another cruiser pulled up. It was David Hunt. I think he is working for the North Hampton Police Department now. And he's a character. "I'm from MO; (Missouri) I gotta see it. What you been drinking fellas?" I could hear him up there rattling and the first one to open his mouth, was Dave Hunt. He says, "What the hell is that?" We looked up and -- here she comes again. I don't know what it is. Gene reached for his gun. He had it out of his holster, I'm not. kidding. He didn't know. What are you gonna do? Human nature, response, something you don't understand you show fear. Well, I understand that now, but at the time I was more afraid of the gun than that thing because I know what the gun can do. So we boogied back to the cruiser and Gene got on the blower and he says, "Scratch, I see the damn thing myself." After that it was taking me home. So he panicked and drew his gun, apparently considering shooting an object he couldn't even see or know what it was! Someone should have taken that gun away from him permanently. Note also how Muscarello's story seems to sound like a pretty brief encounter, followed by just going home. If he had seen the lights coming very close, one would expect him to at least mention that, instead of just talking about that gun, right? Isn't it interesting how the "crazy kid" who was so afraid of those strange lights was more afraid of the gun of the trigger-happy "responsible person"? Maybe "that thing" wasn't that strange and scary after all? There's some interesting similarity to the Coyne case, where one of the crew members who stated how "everybody was yelling and screaming" told he was nevertheless more worried of them running out of fuel. So, (police dispatcher) Scratch Toland called me into the station and asked me to go out with him and see what he saw out there. We got out there, we saw nothing. It was pitch dark. He asked me if I would come down to the field with him, so I walked down the field with him, and he started yelling. I looked over and I saw some object come skimming across the treetops, about 76-80 feet in the air, and it looked like it might be spinning. At first we thought the lights were going from left to right, but it could be we were losing them as the thing was turning. I grabbed ahold of the guy; I yanked him out of the field because I didn't want to get caught in an open field with something swooping down. We got back to the cruiser and Officer Hunt showed up. The three of us watched it for a minute. It took off and headed towards the coast, making no noise, just about treetop level. So now it was Muscarello who wanted to go to the field and saw it first. And Hunt arrived only after that gun episode, when they had went back to the car, and they watched it together "for a minute." Note also how he gives a 4 feet range for his estimated altitude, showing some (extreme over)confidence there with his estimation abilities. By the way, how do you spin a 60 degree row of red lights so that the bottom one is always at the front, as he stated earlier? "We walked out about this far," he said "I waved my flashlight back and forth, and then Norman shouted----'Look out, here it comes!' I swung around and could hardly believe what I was seeing. There was this huge, dark object as big as that barn over there with red flashing lights on it. It barely cleared that tree right there, and it was moving back and forth." Muscarello said it was as big as a barn; to me it didn't look that big. I thought it was just a good-sized plane, like a 124 or something. When Dave arrived, the three of us just stood there and watched it. It floated, wobbled, and did things that no plane could do. Then it just darted away over those trees toward Hampton." Draw a picture that will show the motion that the object or objects made. Place a "A" at the beginning of the path; a "B" at the end of the path; and show any changes in direction during the course. So "no change in direction or angle". That sure is impressive. Hunt stated in his 1980 interview that the lights had a "fluttering motion, like a leaf falling back and forth." He didn't mention those in his original statement or on that form. Did the object appear to stand still at any time? Did the object suddenly speed up and rush away at any time? Do you think you can estimate the speed of the object? Both answered NO to all of those. So when did it stop, hover, jump and so on? The Muscarello-Bertrand-Hunt sighting was actually a two-part sighting. That is, after the right-left traverse of the trees the object vanished in the North as described in the officers’ report forms and as told to Ray Fowler, but then came back again later, going left–right and down to Hampton. And for some reason the various bearing and heading quotes given by Fuller relate only to “part two”. This could fit the last two quotes. When Bertrand said “We [he and Hunt] decided to take off, but waited a few minutes, and then we saw it go off across the horizon towards Hampton” this might imply that this is after the main event is over – otherwise why would they think about leaving, and why would they “wait”? Again, when Hunt describes the recession towards Hampton he qualifies this with “when the thing was leaving this area”. But if this is right, it’s very unsatisfactory that nobody ever makes this very basic fact clear in any quoted statement on the record – either contemporaneously or in later years. It is not easy to understand how people like Fuller, and Fowler – standing there with the witnesses, reconstructing the event, compass in hand – managed not to realise that this is what happened. Why did they not say, “But where is the rest of it?” when handed these half-finished report forms? And if such a strange and jarring mistake had found its way into the early public record, including not only official and private formal investigation reports but also a series of national magazine articles and a best-selling book, it isn’t easy to understand why Bertrand, for example, chose not to take the opportunity to correct it in the accounts he continued to give years later. So, this is still an unresolved mystery. It remains to be seen if a resolution can be found without taking a hatchet to the testimony. I don't think any hatchet would make their testimonies any worse. So how long did they see those lights? Those NICAP forms asked them to "Estimate how long you saw the object". Bertrand answered 10 minutes, Hunt 5-8 minutes, and both indicated they were "fairly certain " about those. Bertrand told in 1980 that after Hunt showed up, the "three of us watched it for a minute," which contradicts Hunt's own estimate. Muscarello claims to have watched the lights for about 15 minutes during his initial sighting in his original statement. If it was a two part sighting, as Shough suggested, those longer estimates could have been total durations with a couple of short traversals and wait time in between. Despite all that uncertainty, Shough still tries to make "conservative" estimates about the arc and duration of traversal for shooting down the theory about a refueling plane proposed by Nickell and McGaha. Here's my conservative estimate how it travel: Who knows with witnesses like that! No, that subtitle wasn't a reference to the supposed flashing sequence of those lights, but their number. A group of five bright red lights appeared over a house about 100 ft from where I was standing. The lights were in a line at about 60 degree angle. They were so bright they lighted up the area. The lights then moved over a large field and acted at times like a floating leaf. They would go behind the trees or behind a house and then re-appear. They always moved in the same 60 degree angle. Only one light would be on at a time. They were pulsating 1,2,3,4,5,5,4,3,2,1. In his original statement, Bertrand also stated it was a "group of five bright lights", they "were always in line at about 60 degree angle" and the "lower lights were always forward of the others." Hunt didn't state their number or those other details. Maybe counting isn't their forte, as I only see four lights. And why two drawings in different angles? Those proposed two parts of the sighting, but he didn't manage to draw a direction arrow for the other? Officer Bertrand described to me in detail how four of the five lights on the near edge of the craft would be illuminated, while only one of the lights would be extinguished, and that the extinguished light would cycle back and forth along the near edge of the craft. It is interesting that Bertrand described this in such detail, because it is frustratingly inconsistent with what the same officer wrote in his statement in the Air Force file. There he said the exact opposite. Instead of one light being off at a time he said that they "flashed _on_ one at a time", matching Muscarello's claim on his own statement in the same BB file to the effect that "only one light would be on at a time. They were pulsating 12345 54321"
So now there were only two or three of them! So I guess we can conclude there were two to five of them then. As for flashing in sequence, that's most likely just another inaccurate invention, since they couldn't even agree on how many lights there were, Bertrand gave an opposite description, and Muscarello who first claimed a sequence later stated just that they were "pulsating erratically." So we get back to what that sighting was: just some number of red flashing lights. Hunt's account becomes particularly underwhelming. Collecting the information from his NICAP form, he just saw two or three flashing lights at a minimum distance of 1.7 miles, flying in straight line. Sounds like planes to me. None of the original statements contain any indication of them seeing any object besides those lights, although that apparently didn't prevent them from trying to guess all sorts of shapes and sizes later. There's one clear conclusion that can be made from those witness accounts: they were horrible eyewitnesses. Their accounts are full of contradictions and their emotional states raise even more questions. It's hard to pick any details that could be expected to be true with high probability. What bothers us the most is that many people are thinking that we were either lying or not intelligent enough to tell the difference between what we saw and something ordinary. Three other people saw this same thing on September 3, and two of them appeared to be in shock from it. This was absolutely not a case of mistaken identity. We both feel that it's very important for our jobs and our reputations to get some kind of letter from you to say that the story which the Pentagon put out was not true; it could not possibly be, because we were the people who saw this; not the Pentagon. Note the apparent overconfidence in their abilities as observers, which certainly aren't supported by their hilariously inconsistent accounts. It has been shown over and over again how even supposedly trained observers have mistook mundane targets as UFOs, but those two believed they were above all that. Those "three other" who "saw this same thing" probably meant Muscarello and the couple of unnamed motorists, who didn't really seem to describe the same thing. Although if we have already arrived to the conclusion that there were 2 to 5 lights, it doesn't make that much difference anymore to update that to 1 to 5 for making it compatible with the other descriptions about seeing "a light". Remember that Bertrand himself said to one of them she probably saw "just a star." Then a theory from the Pentagon came out saying it was a refueling. Then they changed it when they found out I had been in refueling, said I was looking at a planet inversion. Those "planet inversions" sure look strange. Anyone seen one? The one thing that doesn't seem to fit for planes as explanation is the claimed shortest distance of some 100 feet to the observers. It's a claim only two of them made, and from different times, since Muscarello didn't even mention that with the later sighting, and his statements on the first one are self-contradictory and questionable. Georgia, October 20-23, 1967: Police in about a dozen neighboring towns chase a UFO over several days, which in one occasion was said to have come within 500 feet of a police car and lighting up the whole vicinity so brightly they could read their wrist watches in its light. It was also said to have chased them while they drove at 70mph. Various cops described it as a large object, looking as large as the moon, or being 25ft in diameter. Sometimes it was changing color between red, green and white, and shape from oblong to round, and even cloverleaf or rectangular. It was also accompanied by a second dimmer object. A pilot in a small plane also saw it rise from a swamp or river area and tried to chase it, but it receded so fast its apparent size decreased from that of half a moon to only a fraction of it. When they gave up and turned back, the UFO moved back to its original position. It was reportedly also seen on radar alongside the chasing plane, but that turned out to be an uncertain blip or two on the radarscope. Turns out the UFO was always at the same position as Venus, and dimmer Jupiter beside it, and the police agreed their UFO looked like Venus when it was pointed out to them from the sky. The various misperceptions included apparent movements due to autokinesis and relative movement of the observers, apparent larger size when objects are seen near the horizon, combined with some atmospheric effects. Canary Islands, June 22, 1976: A doctor sees a globular craft of 30 meter radius, floating hundred meters from him, with two three meter tall beings in tight suits inside. The craft first raised up, then reached enormous speed, eventually dissolving and disappearing. At the same time other witnesses were seeing the fuzzy globe from Poseidon missile tests far away in the same section of the sky, which the doctor incidentally didn't see. November 5, 1990: An RAF Tornado pilot sees bright lights that formated on his jet, making him to take violent evasive action. Around the same time, a veteran British Airways pilot sees a massive glowing silver disc, flying level faster than anything man-made, and he was sure the craft was out of this world. And dozens in Belgium reported seeing triangular slow soundless object with three lights. Several pilots stated it couldn't have been a satellite re-entry. At the same time a Gorizont/Proton rocket body made a re-entry. March 19, 1997: Two cops (just like in this incident) saw "a large luminous globe of orange color hovering near the ground, 50 meters away. The Moon-like, lighted sphere was stationary and silent. Inside, a tall being was sighted. It was observed during a few minutes." Coincidentally the moon, that large chunk of cheese located some 380,000km away, was in the same place. There's no shortage of such examples. A large 4-engine tanker like the KC-97 with or without added jet pods, with a B-47 jet bomber flying along with it in the act of refuelling, both within a few thousand feet of the witnesses, ought to have been very audible. But all witnesses made a point of noting the total silence. The report forms indicate a calm, clear night with only a light breeze. While all other aircraft operating in 1987 are quieter than their counterparts of 1977, the relatively quiet KC-97 is replaced by the very much noisier KC-135A. Even with two CJ 6105 turbojets in addition to its four piston engines, the KC-97 is about half as loud as the KC-135A (10 dBA) on both takeoffs and landings. Roughly, the KC-135A is louder than the noisiest aircraft in the 1977 fleet, the DC-8 or the 707 by 1 to 2 dBA on takeoffs and 2 to 9 dBA on landings. When you are standing against the wind, no matter how loud you shout, your distant friend cannot hear you at all, but you can hear him very well. Does wind scatter sound wave? Surprisingly, this phenomenon is related to refraction! Sound wave travels faster in the air when it is with the wind. Generally speaking, wind speed is lower near the ground because of the presence of blockages, and so it increases with height (Fig. 1). Therefore, when traveling with the wind, sound wave farther from the ground travels faster. Refraction is resulted from the difference in speed of sound in the upper and lower region, just like how sound wave travels in different mediums. Sound wave will be refracted towards the region with a lower speed of sound, thus sound wave will be refracted downwards when it travels with the wind, and hence it can be transmitted farther away. In contrast, when sound wave t ravels against the wind, that is, when it travels in the opposite direction with the wind, the speed of sound will be reduced by the wind speed, resulting in a lower speed in the upper region. According to the principle mentioned above, sound wave will be refracted upwards, and hence it cannot easily reach a distant person (Fig. 2). Although given the above inaccuracies on their reporting, and reported state of fear, I wouldn't put too much emphasis on their observations about silence either. Proposed solutions include a plasma ball detached from nearby power lines (Phil Klass), fire balloons (Larry Robinson), the planet Jupiter (Robert Sheaffer), a practical joker flying a kite with flasher lights attached to the string (Martin Kottmeyer), and a KC-97 Air Force tanker participating in the Operation Big Blast maneuvers (James McGaha and Joe Nickell). At the moment it seems much more likely to this author that, if the UFO was caused by aircraft, the red flashers were rotating anticollision beacons or the like on a number of individual aircraft flying in formation at much greater distance, which would help explain the slow angular rate across the sky, and possibly the silence also. Several beacons rotating out of phase with a spin rate of a couple of seconds could possibly give the chance impression of flashing in sequence as described. And of course the angular separation of five planes flying abreast or in a left or right echelon could at least start to fit the reported and implied angular sizes. But this takes us back to square one. BB ran into a brick wall attempting to prove this very theory According to SAC all the Big Blast B-47s were accounted for some 30 minutes before the Muscarello sighting began. Turns out that's not really a "brick wall", and pretty much nothing compared to the endless stream of contradictions in those witness accounts. it can be argued that experience proves witness accounts of an exciting event to be often more colourful than the truth (were it known) would sanction, therefore it is not a proof. Which in that case is likely to have applied for example to descriptions on just how powerful those red lights were, which supposedly "lighted up the area". There are notable similarities to the Coyne case, where the searchlight also supposedly lit up the scenery, and the red navigation light was also described as exceptionally bright. It happened similarly during a clear night, probably contributing why the lights seemed to be so bright. The visibility was said to have been 30 nautical miles or "clear (unlimited)", which would put it to the "perfectly clear" curve above (defined as over 31 miles). 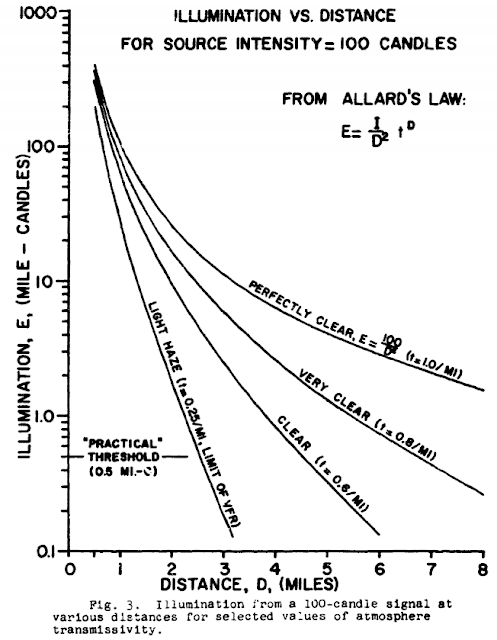 That 100 candles was the minimum requirement for anti-collision lights in 1962 when that report was written. since the human eye/brain combination is capable of suggesting the impression of erratic jumping motions even when the true motion is a steady linear translation, and experience shows that this is especially likely to occur with flashing light sources in a dark sky. Any investigator or any skywatcher who has ever watched an aicraft strobe with the naked eye at night will know this illusion. It is not possible to sink this counterobjection merely with qualitative witness statemernts, because we know that witnesses can and do describe such illusory motions in a similar way when the object is a misidentified aircraft. Again we can check Hendry's UFO Handbook, 32 case numbers 628, 788, 1109, 1144 involving identified advertising planes and Air National Guard planes. These planes "stopped", made "angles that an aircraft can't make", threatened to crash into trees, jumped "straight up", and in one case, identified as a formation of three Cessnas at 2,500 ft, the object seemed to "suddenly whip across the road over the woods". Imagine those at night, with red anti-collision beacons on, and there's your row of red flashing lights. Make them change relative distances, positions, altitudes, speeds, experience winds (which were significant higher up), turbulence, turn etc. and you can get all sorts of leaf-like and erratic motions between the lights. It's hard to see any reason why those couldn't have been simply airplane lights. Given it's even unclear how many of those they saw, it could have been several lights on a single plane, or a formation of several planes. The latter would likely be a better hit for the supposed 60 degree angle, if that is accurate to any extent, and leaf-like or erratic movements between the lights. The most common red lights are the left side navigation light and anti-collision beacons. If the lights were moving from northeast->north viewing directions, left to right, as indicated by the NICAP forms, they would have shown their left side red navigation lights. But even that is uncertain. 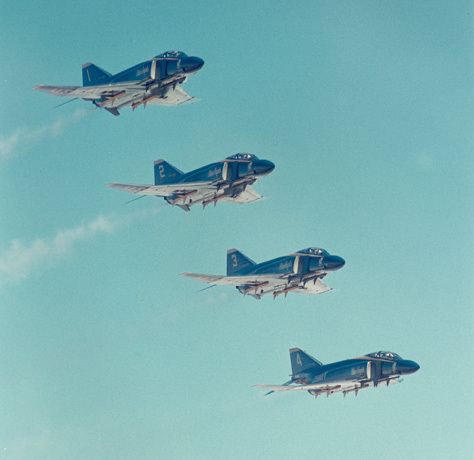 Navigation lights are typically steady, but military planes (including B-47 and KC-97 in 1965, among others) have switches for choosing between steady and flashing, as well as between dim and bright. It could also have been some mixture of both of those types of lights, since nothing seems too certain in this case. For example a couple of planes with red navigation lights and anti-collision beacons, possibly flashing in a bit different rate. In a later interview in 1980, Muscarello stated "the lights weren't completely all red either", so who knows, maybe they saw some white tail lights too at some point, for example. The article by Shough is primarily written as a rebuttal to the theory by Nickell and McGaha, who proposed those lights belonged to a KC-97 aerial refueling tanker, specifically the five pilot director lights, which they called sequencing lights, as reflected from the refueling boom. Shough points out several problems with that theory, including one of those lights being actually green, and that they didn't normally blink in sequence as McGaha claimed to have remembered, and that the lower ones should have be seen farther back, the opposite to what Bertrand said. While I don't think those were the director lights, and some of the other criticism by Shough still stands, given the above discrepancies, I don't think those particular arguments are significant anymore. The witnesses couldn't even agree how many lights there were, and there are contradicting accounts on how they blinked and moved. It seems those lights can be manually controlled, so in theory someone could have flashed the four red ones in any way they liked, for whatever reason. And that wouldn't necessarily mean it was currently refueling anyone. Similarly, I believe Nickell and McGaha were likely misled with reported details that probably weren't accurate in the first place. A refueling boom certainly sounded like a good match for that reported 60 degree angle and movement that was described as "floating like a leaf" (although it was also described as erratic), and the number of lights also seemed like a match. I don't quite understand the way Shough analyzed the configurations of those lights in detail, but didn't mention how the forms filled by the witnesses couldn't even agree on the number of lights, even though he did copy a couple of pictures from those very forms. What the Blue Book believed and admitted? It's hardly a surprise that Project Blue Book considered and proposed just such plane lights as the explanation. The general description of flashing lights is consistent with previous reports of aircraft, refueling operations or low level photographic missions using infra-red lights. On 28 September an investigation attempting to place a specific aircraft of these types over Exeter was made. Results of this investigation indicated that an 8th Air Force operation "Big Blast" was conducted in the New England area and B-47 aircraft from Pease AFB were also involved in the operation. A TWX received on 11 February 1966 indicated that no unusual sightings were made by crews during the time period of the unidentified flying object report. His statement regarding night photography is inconclusive. The only report, submitted to the Air Force for evaluation, is the observation made by the police officers and ___. The other reports, contained in the Look article, have never been reported to the Air Force. Analysis of the report indicates that it is possible for aircraft of a conventional type with rotating beacons or aircraft utilizing infra-red lights in photographic missions to have been the cause of this sighting. Since we have been unable at this time to identify a specific aircraft as the cause of this sighting, the case is regarded for statistical purposes as unidentified. There was no indication that the object presented any evidence whatsoever, of scientific or technical development beyond the present state-of-the-art. There is a total lack of evidence to indicate that the sighting could not have been caused by conventional aircraft. The earlier sightings of two unnamed women and those of Mr ____ are attributed to aircraft from operation Big Blast "Coco." The subsequent observation by Officers Bertrand and Russel occurring after 2 A. M. are regarded as UNIDENTIFIED. The name after Mr. has been hidden, but it has to mean the original sighting by Muscarello. Which means the Air Force believed the original sighting of those five red lights was in fact attributed to Big Blast. If so, it hardly makes sense to believe a similar sighting later would have been something else then. And according to the above, they didn't designate that case unknown because it couldn't have been a plane, but for statistical purposes, because they couldn't identify the exact plane(s). So it doesn't look too well established when they actually saw it. Big Blast "Coco", a SAC/NORAD training mission, was flown on 2-3 September, 1965. By 03/0430Z, the operational portion of the mission was complete and participating aircraft were enroute to their home stations. Those were stated as estimated arrival times, instead of "counted back"
Pease AFB was indicated to be one participant, but there could have been others from elsewhere "enroute to their home stations." In addition to aircraft from this operation, there were five B-47 type aircraft flying in the area during this period. Before a final evaluation of your sighting can be made, it is essential for us to know if either of you witnessed any aircraft in the area during this time period either independently or in connection with the objects observed. Since there were many aircraft in the area, from personnel engaged in this air operation, we might then assume that the objects observed between midnight and 2 A. M. might be associated with this military air operation. Shough tries to explain that away as a likely misunderstanding of them being part of the ten in that exercise, but the truth of the matter is unclear. There doesn't really seem to be any "fatal" timing issue. There's no need for those planes to have been part of that exercise, or of some specific type, or originating from Pease AFB. It's enough to have some traffic in the area, and there are no clear statements claiming there wouldn't have been any. On the contrary, there's one very important saying there was. Immediately after the object disappeared, we did see what probably was a B-47 at high altitude, but it bore no relation at all to the object we saw. So they saw one, immediately after. So was there for example four others, flying at somewhat different route, altitude or configuration of lights, or others that were of different type? it is not without irony that in order to support their thesis Nickell and McGaha are happy to rely on Bertrand's identification of a B-47 (presumably by its sound and/or lights) seen at altitude just after the sighting. There seems to be also some irony in how Shough himself tries to make the case that there's a serious issue of missing planes, yet he seems to just ignore that crucial witness statement he mentioned before of a plane having been there even later than the sighting. On this basis we should regard the reference to those five phantom B-47s as, at best, hopeful speculation and, at worst, a manipulative half-truth. Well, there already was one phantom B-47 reported by Bertrand, wasn't there? If it is hopeful speculation to believe that was there, how about having hopes of aliens based on the testimonies of those same phantom plane spotters? We heard Hampton talking -- and they had just got a call that some man in Hampton had a red object swoop down at his car. He called Hampton and they sent their cruisers out. They called Pease (Air Force Base) and they sent out a couple of fighter planes. That was his 1980 interview version, earlier he stated they got that call when they had already been back to the station for a short while. So now there were also fighters in the air, around the same time, unrelated to the exercise. Who knows what else. So where does that leave us? Some dudes saw lights in the sky, panicked, gave inaccurate and contradictory statements, and kept changing their stories. There's every reason to suspect those lights were attached to conventional planes, and that's what Blue Book investigators stated early on. There was plenty of known air traffic in the area close to those times, and at least one plane after that sighting, if we are to believe those dudes in anything. And since the pilots of those planes apparently didn't report to have seen anything weird, even the one that flew there right after, there's good reasons to suspect they themselves were the weirdest thing in the air. Can we identify the exact planes? Hardly from so poor data, since its unclear even how many there should have been. Does it matter? Not really. The bottom line is really this: The Exeter incident isn't a good UFO sighting in any way. There's a highly probable mundane explanation, it just lacks in details, because the witness statements are so low quality. It's also in no way special, there are plenty of similar cases with people making similar observational errors. Like so many others, it seems to be listed among the "best UFO cases" for historical reasons, and because of its importance to the UFO lobby, and because they pick and choose details ignoring others, not because some real high strangeness. Colonel Eric T. de Jonckheere stated the case is regarded unidentified for statistical purposes. He could as well have said that was to keep ufologists and those witnesses happy. At least not being able to identify the exact conventional plane(s) due to missing data seems to be enough for many to keep cases like this on the lists of supposed best cases. But that really just highlights how bad the rest of the cases are. Unknown isn't the defining feature of this case, worthless is, worthless in terms of being evidence of anything, apart from the low quality of UFO reports. Speaking of low quality, it should be noted that the general area was already famous for another supposed UFO incident, the 1961 Betty and Barney Hill "abduction". As a case it has about as much credibility as the rest of the abductions, that is, none. It has been explained as being triggered by an aircraft warning beacon that had been installed on a mountain a couple of years before, helped by sleep deprivation for driving some 21 hours, and subsequent delusions and false memories under hypnosis. Betty reportedly visited her supposed abduction site 2-3 times a week for years and saw six or eight UFOs each night. She was "unable to distinguish between a landed UFO and a streetlight", according to one UFO proponent, who was once there with her. It should be noted that the same author, John G. Fuller, made both of these incidents famous, and a nice amount of cash for himself. Betty reportedly got her fair share of the profits, whereas Muscarello got none. Both of these incidents are celebrated yearly at the Exeter UFO Festival, which acts as a local fundraiser. I guess incidents like these live as long as there are profits to be made, and delusions to be maintained. Hi, I’m Martin Kottmeyer, the individual who proposed the Exeter case involved a kite with flashing lights. A friend brought your page to my attention. I’ve perused the page. Today, I merely want to bring to your attention that I penned a series of nine comments about Exeter last year between April 27 and July 10, 2017 on my Mrherr Zaar Facebook page. Most build on Eddie Bullard’s comment about how art done about the case in various publications is usually misleading. One titled “Exeter – The Case Nobody Gets Right” (April 27, 2017) should at least indicate one point all skeptics can agree on. My 1996 REALL piece “The Exeter File” brought forward my argument for why the case should not be thought of as extraterrestrial or even similar to other ufo cases. It is a case with no exact parallel and provides a puzzle for why anybody should regard it as a classic in the parade of evidences thought to demonstrate the reality of the ufo phenomenon. “Exeter Eddiefied” (May 5) and “Exeter – The Drawing by the official Witnesses and Others” (July 10) puts forward my response to Bullard’s points for rejecting the kite solution. I imagine you will choose to ignore or reject my proposed solution since, short of renting a time machine, there is no way to make it completely convincing, only more convincing relative to the ETH. However I hope you will find observations of interest among my scribblings in support of the critical stance. The matter of motive – why Exeter? The sequencing lights - isn’t that the Irwin Allen aesthetic of the Jupiter 2 and Seaview? Doesn’t a “fluttering” device suggest something impractical for any purpose? Nice to here from you here! I happen to have a half written post about the Father Gill case, with the TLDR version being: I believe you nailed it, I don't see anything wrong with your solution, and hence I concentrated on the other sightings reported by Cruttwell. Unfortunately I haven't really had time for this blog lately, so I haven't managed to complete that post yet. My main point here was that the Exeter case is fundamentally just a few unreliable and contradictory reports of lights in the sky. It apparently gained so much prominence because the witnesses were considered reliable, but they clearly weren't. Rather than being unexplainable, it actually has multiple plausible explanations. I think your solution is a very good one, and the best if we choose to believe certain parts of the witness accounts are accurate enough, namely the estimated short distances and formation and blinking sequence of the lights. So I really don't have any issue with your explanation as such, which neatly explains many of the reported details, but I'm just not convinced of the accuracy of those details in the first place, for all the aforementioned reasons. Those details are mostly based on single accounts only, and contradicted by others. Muscarello didn't really describe the latter sighting in detail, and called those lights just erratic years later. Hunt only reported seeing 2 or 3 lights a few miles away. Muscarello and Bertrand seemed to have problems remembering what happened during the incident, even soon after the incident, let alone years later. Both seem to have invented details out of thin air. Planes as an explanation assumes larger observational errors, but they are the kind that are known to have happened in other cases as well, including some I mentioned above. Planes are known to have flown in the area, which makes them somewhat more attractive explanation than something whose existence is completely unknown. That military exercise and other reports further away within the area also seem to hint towards air traffic that confused others as well. In that context, the kite explanation seems like a bit of a coincidence, happening in addition and simultaneously to those other events, and apparently unnoticed by the flight crews that flew nearby and at least one reportedly soon after. But maybe they just weren't close enough or ignored something like that low below. On a personal note, I actually happened to see two red lights that flashed in sequence, not quite in 60 degree angle, but maybe 30-45 degrees, only some week ago. It was some smallish plane (and had at least one visible wingtip navigation light as well) that had the top and bottom anti-collision beacons in somewhat different positions, blinking in sequence instead of simultaneously. So depending on how many lights there actually was, one or two planes might already be enough for such sequence, even if they wouldn't quite flash the way Muscarello originally stated. In any case, my aim was not to belittle any of the explanations, but to highlight that the one Blue Book proposed already back then is sufficient for explaining the case, when we factor in all the uncertainty that is evident from the witness accounts. We are probably already beyond the point when any of the alternatives could be actually confirmed, but the fact that we have multiple and vastly different explanations that can't be ruled out either should really be seen as an indication of the low quality of the original case. There's no point blaming the explanations for that. Great job on this piece as well as the Coyne incident.